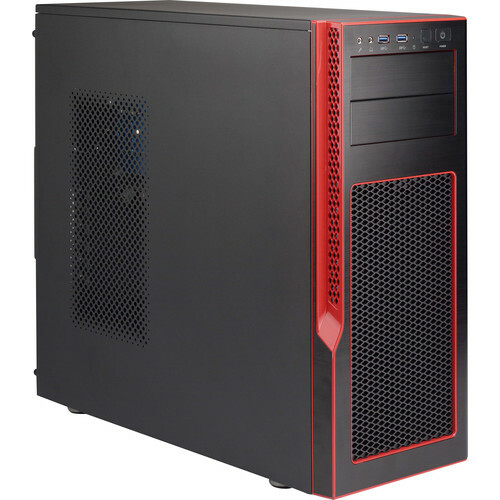 The black and red S5 Special Edition Mid Tower Gaming Case from Supermicro sports an all-black interior ideal for DIY PC gamers. Constructed from steel and aluminum, this case supports standard ATX and Micro-ATX motherboards and features tool-less drive storage for easy installation of up to two 5.25", four 2.5", and six combo 3.5"/2.5" drives. If not required, the HDD/SSD cages can be removed for improved airflow throughout the chassis. This case has seven expansion slots that can accommodate multi-GPU setups. Multi-GPU systems run hotter than single-GPU systems, so use the nine supported fan locations to cool the system as needed. There are three pre-installed fans in this case: two 120-mm PWM fans in the front and one 120 mm PWM fan in the rear. PWM (Pulse-width modulation) fans can have their speed controlled by the motherboard's PWM capabilities and optional software. On the front panel there are two USB 3.0 ports, one microphone jack, one headphone jack, and power & reset buttons. Within the case are multiple cable-management holes with rubber grommets for a clean build. To make installing parts easier, this case has a large motherboard tray cutout, which lets you to install CPU coolers with the motherboard already in place. Additionally, the removable magnetic dust filters and one-click access to the front grille simplify cleaning and system maintenance. Without any additional components installed, this case is whisper-quiet at 23 dB. External Drive Bays 2 x 5.25"
Internal Drive Bays 6 x 2.5"
Box Dimensions (LxWxH) 22.3 x 20.5 x 10.6"